Asacol Common Uses: Asacol used to treat ulcerative colitis. IMPORTANT NOTE The following information is intended to supplement, not substitute for, the expertise and judgment of your physician, pharmacist or other healthcare professional. It should not be construed to indicate that use of the drug is safe, appropriate, or effective for you. Consult your healthcare professional before using this medicine. 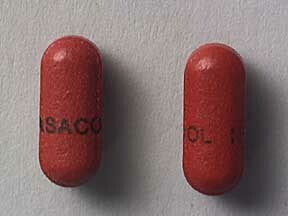 Asacol Common Uses: Asacol (Mesalamine) is an anti-inflammatory used to treat ulcerative colitis. Asacol (Mesalamine) also be used for other conditions as determined by your doctor. How to use Asacol: Use Asacol (Mesalamine) exactly as directed by your doctor. SWALLOW WHOLE. Do not break, crush, or chew Asacol (Mesalamine) before swallowing. You may take Asacol (Mesalamine) with food or milk to decrease the chance for stomach upset. STORE Asacol (Mesalamine) at room temperature in a tightly-closed container, away from heat and light. IF YOU MISS A DOSE OF Asacol (Mesalamine), take it as soon as possible. If it is almost time for your next dose, skip the missed dose of Asacol (Mesalamine) and go back to your regular dosing schedule. Do not take 2 doses of Asacol (Mesalamine) at once. Asacol Cautions: DO NOT TAKE Asacol (Mesalamine) IF YOU HAVE HAD A SEVERE ALLERGIC REACTION to aspirin or any medicine containing aspirin. A severe reaction includes a severe rash, hives, breathing difficulties, or dizziness. If you have a question about whether you are allergic to Asacol (Mesalamine), contact your doctor or pharmacist. IF YOUR SYMPTOMS DO NOT IMPROVE or if they worsen after you start using Asacol (Mesalamine), check with your doctor. DO NOT STOP USING Asacol (Mesalamine) without first checking with your doctor. KEEP ALL DOCTOR AND LABORATORY APPOINTMENTS while you are using Asacol (Mesalamine). INTACT OR PARTIALLY INTACT TABLETS ARE OCCASIONALLY found in the stool. If this occurs repeatedly, check with your doctor. FOR WOMEN: Asacol (Mesalamine) IS EXCRETED IN BREAST MILK. IF YOU ARE OR WILL BE BREAST-FEEDING while you are using Asacol (Mesalamine), check with your doctor or pharmacist to discuss the risks to your baby. Asacol Side Effects: Asacol (Mesalamine) SIDE EFFECTS, that may go away during treatment, include mild diarrhea, dizziness, mild headache, runny or stuffy nose, sneezing, acne, back or joint pain, gas, heartburn, loss of appetite, hair loss, or mild abdominal discomfort or pain. If they continue or are bothersome, check with your doctor. CHECK WITH YOUR DOCTOR RIGHT AWAY if you experience severe cramping, severe abdominal pain, bloody diarrhea, severe headache, or rash. If you notice other effects not listed above, contact your doctor, nurse, or pharmacist. for diagnosing or treating a health problem or disease, or prescribing any medication. You should read carefully all product packaging. If you have or suspect that you have a medical problem, promptly contact your health care provider. Asacol Side Effects Mesalamine Buy Asacol Canada Pharmacy Discount Asacol for treatment of ulcerative colitis - Buy Asacol 400 mg from Canadian Pharmacy and Save.